Size: 212 sq. m. "Custom built home"
Set behind the gates of a private oceanfront golf course community, sits this 2200 sq. foot custom built two level home. A large entry foyer greets you as you enter the house with two downstairs bedrooms. One of the bedrooms has its own private bath. Both guest rooms have sliding glass doors that lead to the back patio area which is ready to be customized by its new owners. The upstairs has an open floor plan with high wood beamed ceiling and a large brick cupola above the dining table area. The living area also has plenty of great natural lighting and a raised fireplace. Another great feature is the upstairs terrace where you can enjoy the Bajamar garden views and community as well as some peek a boo ocean views. The kitchen has plenty of cabinet and counter space as well. The master bedroom is set upstairs and feature high wood beamed ceilings with a walk-in closet, private bath with double sinks and a walk out balcony with some ocean views. 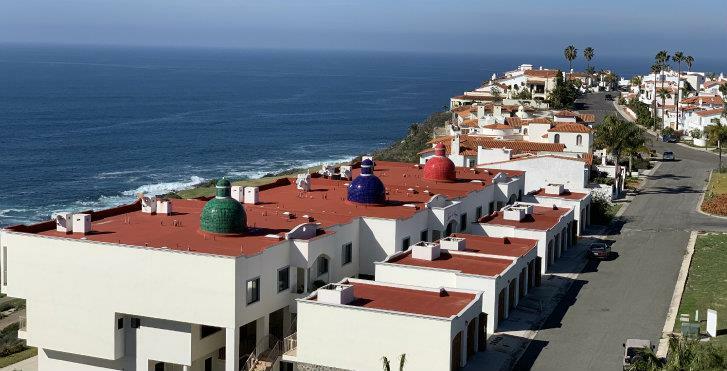 The private community of Bajamar is located only 55 miles south of the San Diego border and is connected to the Tijuana-Ensenada toll road. This community features low HOA fees, only $135.00 U.S. a month and features a community club house, pools, tennis courts, discounts and the restaurant, hotel, bar and 27 hole golf course. This isn't just any home..its a lifestyle. Call us to make an appointment to see the great property.